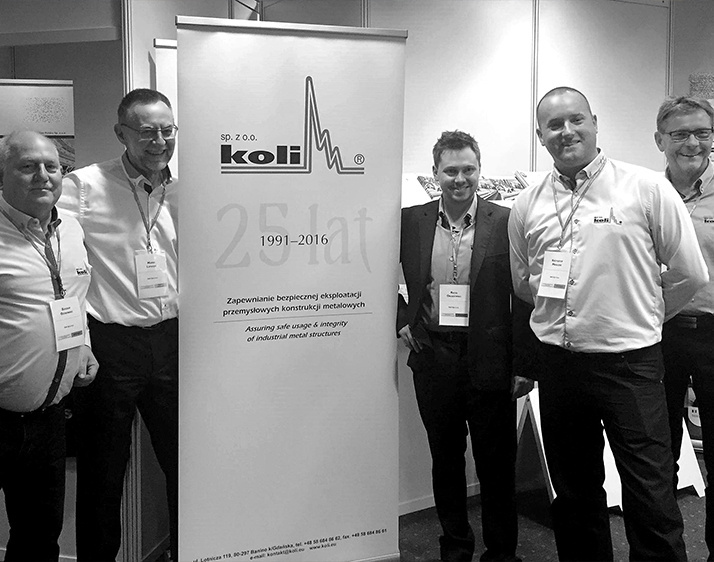 With a great pleasure and satisfaction we would like to offer you a cooperation with our company which has been established in 5th March 1991 as Koli Ltd.
We provide NDT services, including independent inspection, supervision and examination. We will be happy to advise you in the field of NDT and recommend our professional instruments, equipment and consumables for non-destructive testing coming from the best manufacturers from all over the world. We specialize mostly in non-destructive electromagnetic (MPI, ACFM) and ultrasonic (UT, UTT, PAUT) testing of welding joints, forgings and castings in construction facilities in petrochemical, refinery, paper, power and many other industries. Experienced and specialized operators, advanced instruments and equipment, professional qualifications and references provided by renowned customers from all over the world encourage us to invite you to cooperation and ensure you that all the entrusted tasks will be completed reliably, professionally and on time. Magnaflux (A Division of ITW Ltd) is a global manufacturer and market leader within non-destructive testing (NDT) equipment and consumables for magnetic particle and dye penetrant inspection solutions to clients that demand the highest level of quality and service on account of working with products and components which are used in safety critical environments. Magnaflux products are internationally renowned and applied in aerospace, automotive, energy, food and drink, general manufacturing, marine, offshore, oil and gas pipelines and railroad for detection of cracks, surface-breaking flaws and near-surface flaws. Magnaflux EMEAR is dedicated to provide support and service to local regions. There are 3 offices (UK, Germany and Sweden) and additionally an extensive network of more than 80 distributors to ensure that customers have the right level of local service and support. RWE Power International's (RWE nPower's) specialists services cover every aspect of owning and operating power plant, from construction, commissioning, operations and maintenance, to eventual decommissioning. Inspection specialists have developed computerized high-tech systems for complex geometries of turbine and generator rotors. Level of technical development and reliability of inspections offered by RWE nPower for power plants are unique in Europe. IMechE ETS (formerly Argyll-Ruane), part of the Institution of Mechanical Engineers, are the leading global provider of inspection and non-destructive testing services. Services include NDT and inspection training courses, examinations and consultancy. Owner of Sonaspection International Ltd.
Sonaspection International Ltd. offers wide range of standard blocks, custom flawed specimens as well as educational specimens for training and examination to different NDE methods. The highest quality specimens are delivered with implanted flaws precisely located, sized and identified. Sonatest Group is a group of British and American manufacturers of NDT systems, instruments, equipment and accessories. Sonatest is well known since 1958 as the leading manufacturer of the highest quality ultrasonic instruments and their accessories. TSC was established in 1984, as a spin-off from University College London, by a team of Professors and Lecturers who were recognized leaders in the fields of NDT, robotics and fracture mechanics. ACFM® was developed with support from BP, BG, Conoco and Shell, who were keen to dramatically improve the reliability of underwater inspection, reduce the reliance on the operator and provide auditable inspection records. TSC develops, designs and manufactures ACFM® equipment to detect surface-breaking cracks in structures and components located above and underwater, up to depths of 2000 m, diver or remotely deployed.